Hi, welcome all and here I am again with an interesting topic for you. 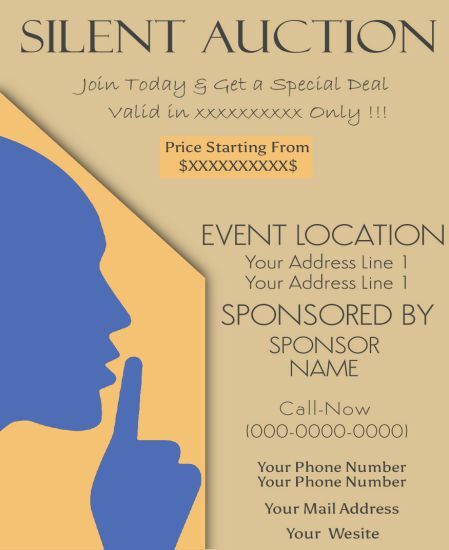 Yes, today’s post is on silent auction flyer templates! 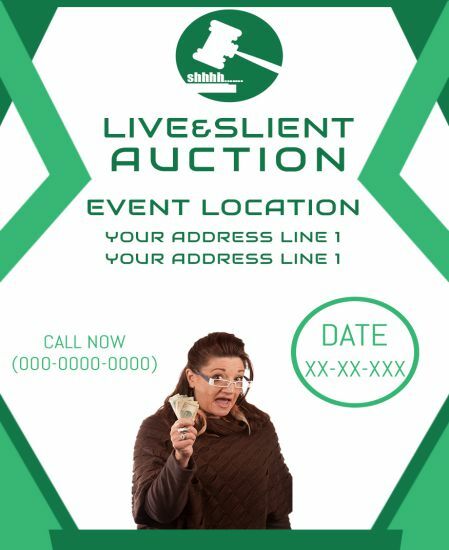 So, what is a silent auction and what are flyer templates? How these two are interrelated and are making a sense? No, please don’t be confused as I will explain each one of these in this post. So, here we go. I know you all have come across flyers as these are commonly used by businesses to create a buzz about their products and services. Some businesses also use well-designed flyers to announce a grand opening of their new store, a discount on their store items or regarding a special event that they are organizing. Now, you may be thinking that why I am making an unnecessary rant about flyers as you are curious to know about flyer templates instead. See, flyer templates are nothing but an affordable way to create eye-catching flyers within no time without hiring a professional designer for the same. Having readymade templates will help you a lot if you are a small business owner. 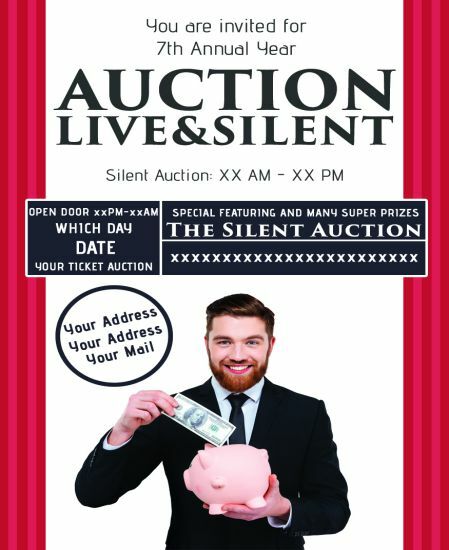 What is a silent auction? 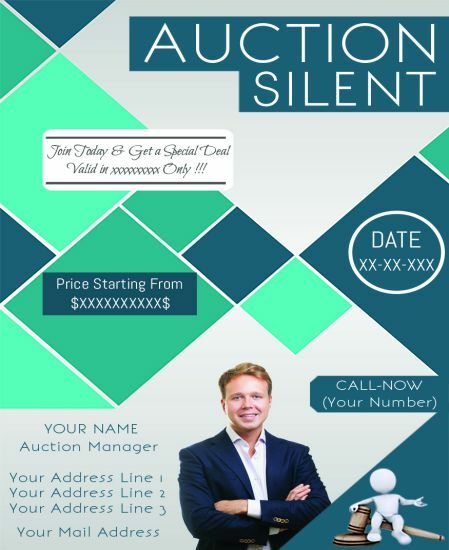 Auctions that are held without the presence of an auctioneer are called silent auctions. Here, several people place their individual bids for items put on auction on paper sheets. These bid sheets are then collected by the auctioneer or by volunteers hired by him or her. If you are planning to organize a silent auction, it is better to plan ahead to avoid any last minute hassles. Now, there are online silent auctions also that are becoming increasingly popular across the world. However, silent auctions organized during a gala dinner party are still popular. 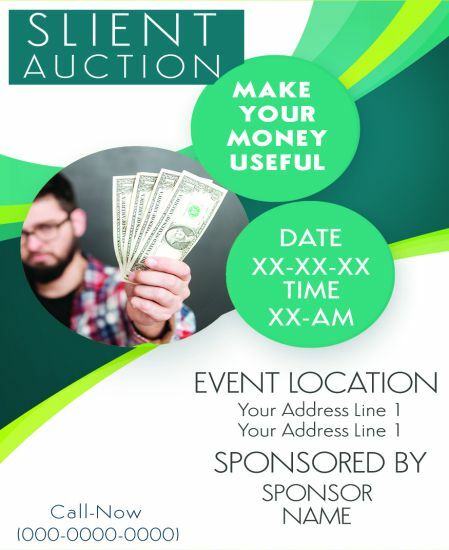 So, now that you have posses a brief understanding of silent auction and flyer templates, let’s move to the next level which includes getting some knowledge about ideas regarding a fundraising flyer. 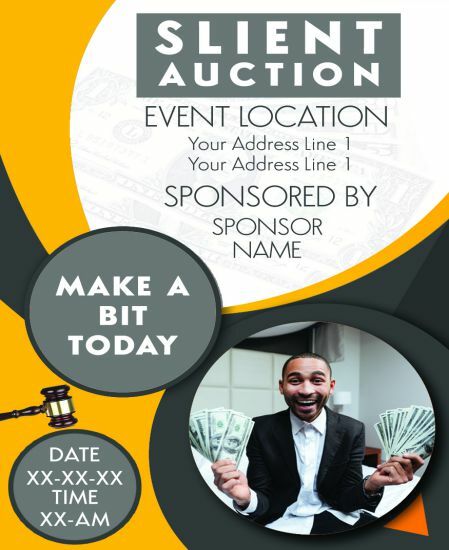 I mean to create a flyer for a silent auction for fundraising, you will definitely need some ideas or else it will be extremely tough for you to create a flyer from scratch. So, let us have a look. You may think that even if I give some ideas, you can never implement the same in absence of a designer to create such flyer, but this is not true! Well, I will assist you at each step and will give you templates for the same in this post but before that have a look at the top five fundraising flyer ideas. Such a flyer mostly features an eye-popping image of perfectly baked cakes and colorful border. You can also add some images of ribbon and other elements that can accentuate its beauty. See, this is one of the most preferred fundraising flyer idea as Christmas is a hugely popular festival and in no way, it could happen that people in a festive mood will not get attracted to such a cause. This one is a brilliant idea as to celebrate Christmas, kids obviously need toys and many are deprived ones in this world. There is a huge gap between kids who have it all and who have little to feel the excitement of any festival. You can easily raise funds for an upcoming music concert by creating a flyer with some images of singers or tunes or even both interspersed in a beautiful manner. Ok, now that you have a fair share of ideas about fundraising flyers, I believe that it is to time to enlighten you on silent auction fundraising ideas. May be you can create your own silent auction fundraising flyer after having so many ideas! It is quite simple, but still if you feel that it is not the right time to start and you need some more ideas specific to silent auction, don’t worry. I am here for you to assist you with my professionally designed templates with various catchy designs and a nice color palette. All that you need to do is to have a look at all my templates and select the one that you think suits you best. Now, coming to the point, I am discussing some silent auction fundraising ideas. Before that, I feel it is important to inform you that there are always some items that can help you to raise funds more easily than others. Again, here there is a clear difference between organizing a silent auction for fundraising for your own personal gains or for a nonprofit cause. Raising adequate funds via a silent auction is always easier when it is for nonprofit. However, with some interesting ideas, it could be the other way too! The best items for a silent auction are those which have a high revenue generation potential and are interesting enough to prompt your guests to place their bids for your cause. Otherwise, there is no point to collect those items from various sources and organize a silent auction. Believe me; you can create stunning silent auction flyers while keeping in mind the above items that always manage to generate a lot of interest among the guests. So, I guess, you have already had some nice silent auction flyer ideas at your disposal. Cheers!!! So, the nest step is to design the flyer templates but ask me how? Well, you still do not have any ideas about the wordings that you should put in such a flyer and to know the same, it is better to understand the process, especially the way in which you need to invite people to a silent auction fundraiser event. How to invite someone to a silent auction fundraiser? 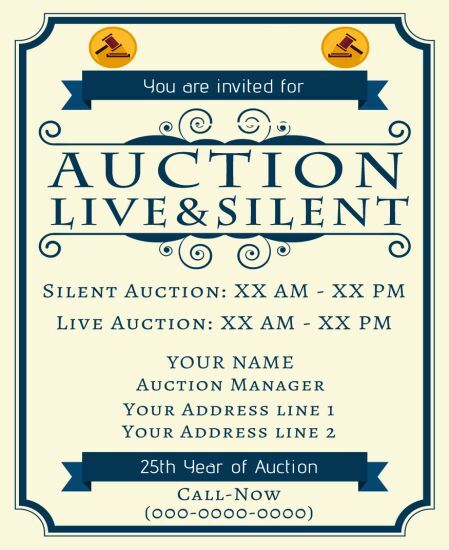 Since most of the silent auctions for fundraising get coincided with some other event, it is best practice to know that how you should invite someone to a silent auction fundraiser event. This also helps you to stay organized and your guests informed of the way they should dress and should expect from you. However, it all depends on the type of relationship you share with that someone. For example, if you are organizing a silent auction fundraising event for close friends and colleagues, you can be pretty much informal and if it is not that way, the invitation should be extremely formal. First, you need to communicate to communicate them clearly about the location, date and time with correct spelling and absolutely no typo mistakes. 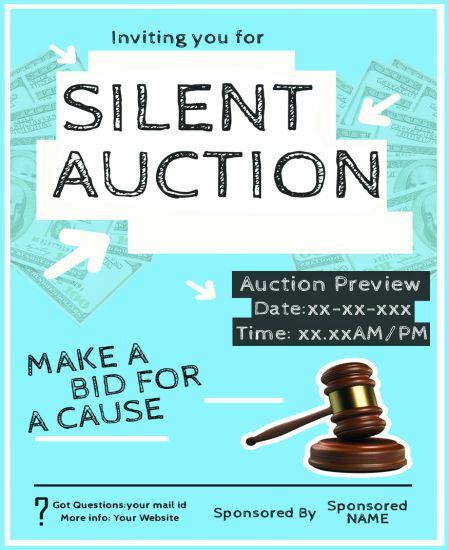 See, if you pay attention to these little things, you will have no difficulty in putting wordings for your silent auction flyer. It is better to also include the time when bidding will start and stop as well as to the reason of organizing the silent auction. You can use words like “benefitting the Girls club”, “Benefitting our local school”, “proceeds benefit the local marines”, and so on. If all your funds will benefit one single person or family in an immediate need of funds for medical expense, to cope with an illness or to support him or her to continue education, it is essential to write the world like “100 percent of proceeds will benefit the name of the benefactor”. 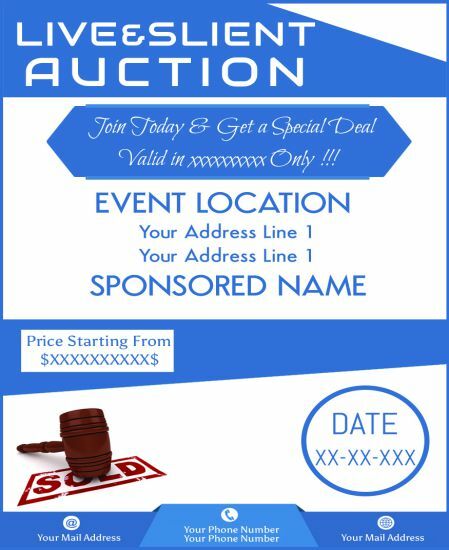 To raise money for a family in need using silent auction is not very tough if you have an understanding about the entire process as well as have flyer templates. So, why are you waiting? 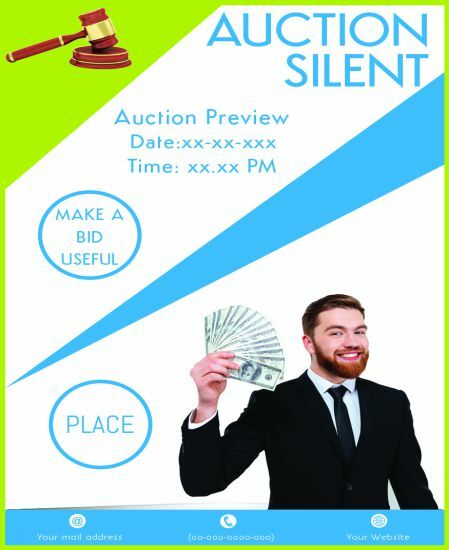 Just browse my readymade silent auction flyer templates and download with a mouse click for free! Be it used for fundraising or not, you can always make use of my templates as these can be customized with your basic computer skills. Also, stay tuned to my next post and share with me your opinion on my collection. I am always looking forward to have your comments.